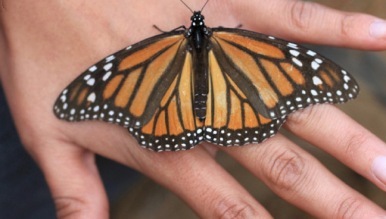 Witness Mexico’s amazing migration of millions of Monarch butterflies! From a fir-forested mountaintop in Mexico’s Central Highlands, the trunks and branches of the trees appear to be blanketed with rusty autumn leaves. A closer look reveals that they’re quivering. And then, as the sun emerges from behind a cloud, tens of thousands of monarchs take to the sky in a swirl of orange—so many butterflies that we hear the flutter of their gossamer wings, translucent orange as they are backlit against a blue sky. Sometimes, the monarchs even float down to alight on our hats and shoulders. This amazing journey, co-sponsored by the World Wildlife Fund is limited to 14 travelers each group and helps protect the monarchs by stimulating the local economy. 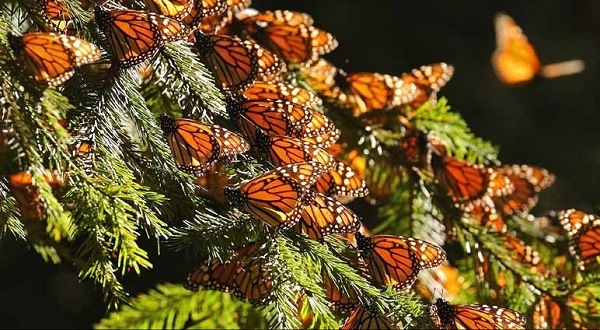 Every autumn, tens of millions of monarchs set flight on a remarkable 3,000-mile journey from the northeastern U.S. and Canada to their ancestral wintering grounds in the volcanic mountains of central Mexico. 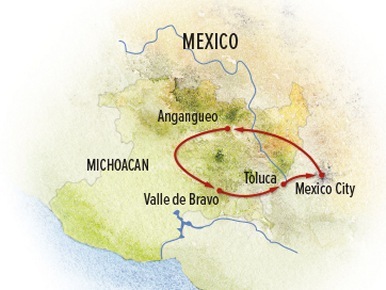 The itinerary includes a horseback ride to the Chincua Butterfly Sanctuary and visit to Toluca, originally a 13th-century Indian settlement, where you’ll see the Cosmovitral Botanic Gardens, with its beautiful stained glass panels, and the lakeside market resort town of Valle de Bravo. At your side throughout your tour will be one or two NHA Expedition Leaders. While the number of guides depends on the number in your travel group (usually not more than 14), we ensure that the maximum traveler-to-guide ratio will never be more than 8:1. Plus our guides are the highest-quality Expedition Leaders in the industry. This excursion’s monarch guides average 19 years’ experience, with in-depth training as naturalists. And, they receive additional resources from WWF’s top scientists, as well. 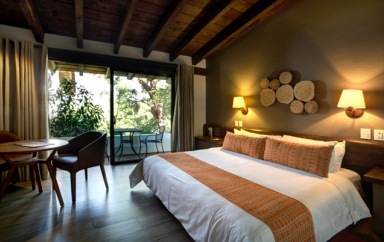 Accommodations include a cozy inn in the small mountain hamlet of Angangueo, (where you’ll savor home-cooked dishes sourced from fresh local food) and a luxury spa resort situated in a lushly wooded region of the Sierra Madre Mountains. Extensions available for this tour include a one day visit to the Pyramids of Teotihuacan, or a four day Humpback Whale Watching Expedition in Puerta Vallarta. This six day tour has departures in January, February and March 2019 and starts at $3,395 per person, based on double occupancy. Ground tour departs from Mexico city, airfare is extra.